Pros: Delightfully stereotypical British and German characters, and there’s nothing wrong with that. Cons: The jokes and witticisms are as exclusive as the aristocratic set who first tread the lawn at Glyndebourne in the 1930s. An affectionate but entertainingly critical look at Glyndebourne’s early beginnings, seen through the lens of a touching marital love. 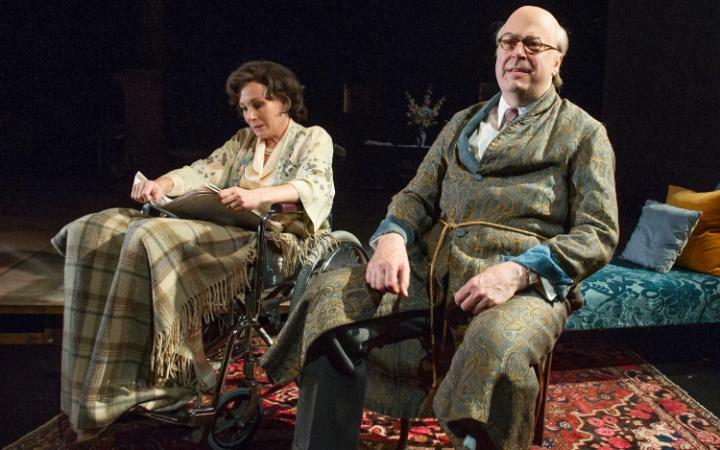 Towards the end of The Moderate Soprano David Hare’s characters come to a moment where they recognise that the best of times were in the beginning, in the starting out. This struck a chord, because it was this very philosophy that drew me to the play before I’d ever known I was coming to review it. How does one build an opera house? How do you begin such an endeavour? Are you crazy? I wanted a thrilling tale of British achievement and dogged persistence; the opera equivalent of the battle of Agincourt, but with less French people and several German theatre-makers. David Hare did not disappoint me. The origins of the renowned English opera house Glyndebourne write a fascinating piece of history, wrapped as they are in the Nazi’s attack on German culture and artistic freedoms – and those of the rest of the world. The personal story of eccentric John Christie, founder of this great British institution, is likewise incredibly interesting to watch. 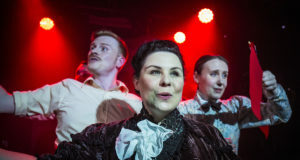 The play’s strength lies in the fact that Hare draws a line from each piece of history back towards this passionate man and his marriage to his wife, Audrey Christie – the eponymous Moderate Soprano. Christie is an emblem of that wonderfully British collaboration between charming and pompous. Roger Allam finds the perfect balance between the two, so that even when Christie behaves like a truculent CEO you can’t help but like him and respect his love for music. Nancy Carroll plays his adored wife with feminine gentleness and stoic self-command; you understand why Christie abandoned bachelorhood after 40 years. Their love story is written with an unabashed nostalgic sentimentality, but the characters are flawed, and their relationship is not a performance by design, so cynicism forgives. Hare’s dialogue is warm and funny, sentimental not only about love but about opera, theatre, and art. 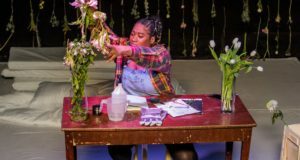 It’s slightly prophetic at a time when we anticipate a reduction in the Arts Council’s grant that one of our best playwrights is shouting from the London stage that art is sublime; art is worth it; put your hand in your pocket and pay for it, because it’s worth it. I’m sure it is, but everyone in the audience already knows that: it’s why they’re there. I do wonder whether the play has unintentionally slipped into the inherently elitist landscape that opera inhabits. The witty remarks about composers, conductors, singers and technicians are amusing for the North London literati, but would you appreciate them if you’ve never been to the opera? But you can’t please everyone I suppose, and lines such as ‘Yes, Mozart was a genius, but was he any good?’ are universally funny. Roger Allam was so convincing an advocate for opera’s national value that audience members just might be converted. 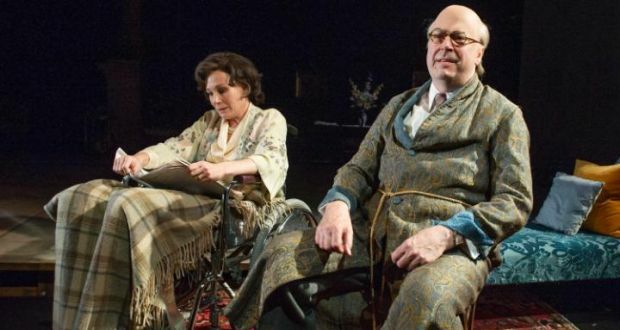 In The Moderate Soprano David Hare channels that infallible British wartime spirit that we usually desecrate by littering our living rooms with union jack memorabilia and hanging faded posters about rationing over an Aga. It’s a love letter to Britain, and a love letter to creativity, celebrating the best in musical, dramatic and literary expression. And so it’s perfectly at home at Hampstead Theatre, my favourite theatre in London. A far cry from Glyndebourne’s first jewel box building, the facilities at Hampstead are first class. And if things go well with the housing crisis I might set up camp there, and rent a seat in the stalls on a more permanent basis.